Irritable Bowel Syndrome (IBS) has an unknown cause. Although stress, poor diet, and abnormal muscle spasms in the colon aggravate the condition all that is known is that the muscles in the intestines and colon spasm irregularly and cause cramps, bloating, and indigestion. Not all IBS sufferers experience the exact same symptoms. There are three kinds of IBS. IBS - C is characterized by constipation. IBS - D is characterized by diarrhea. IBS - A alternates between cases of constipation and diarrhea. Stress reduction and a change in diet are usually the first step in getting help for IBS. Stress from work, school, changing jobs or living situations, and any number of other stressors can aggravate IBS. Large meals and even some prescribed antibiotics can trigger diarrhea and constipation in those with IBS. A sufferer can help IBS by avoiding certain foods, alcohol, and milk products. Some sufferers are more sensitive to certain foods than others. Recognizing what foods trigger symptoms is an important part of awareness. IBS sufferers turn to laxatives or other over-the-counter medicines in hopes that the condition is temporary. But IBS is a chronic condition. Improper or excessive use of laxatives can cause further problems for those with IBS. Although IBS doesn't cause serious conditions such as colon cancer or intestinal damage, hemorrhoids can result if it goes untreated. Most people don't know that IBS help is available. Even though the condition can be hard to talk about, it is important to know that there is something that can help IBS sufferers who need to constantly worry about the symptoms. In the U.S., about 15% of the individuals have experienced IBS. This condition starts mostly in adolescents. It affects almost two times as many women as men. IBS is normally related to anxiety. There has been no known IBS cases which damaged the gut or caused cancer, however the condition is painful. Having said that, long term IBS may cause depression or hemorrhoids. Physicians agree that typically IBS happens because of a neurological problem. The intestines get messages from the brain, while they send impulses back. If you are under stress your brain fires either too few signals or too many to intestine muscles. This problem causes the intestine to move food through the intestines too slowly or too fast. Because of the condition, painful cramps and diarrhea or bloating and constipation can happen. Those with sleeping disorders, anxiety, and stress can get IBS. There are OTC meds to deal with constipation or diarrhea and people think they are the best treatment. These medicines provide only short-term relief. It's impossible to address the real problem with these meds. Since IBS is strongly related to stress and anxiety a physician may prescribe an anti-anxiety drug. Although these may somewhat help IBS, some individuals develop dependence. Make sure you know exactly what chemicals are in the drug, so you know what down sides you get from taking them. When taken as directed and following the advice in our eBook you should see a considerable improvement in a few days. We want to make our customers happy and healthy, and that's why we offer a 60-day money back guarantee. Our promise is simple: If you don't see a significant improvement, we don't want your money! Product safety is extremely important for us. Bavolex™ contains only natural plant and herb extracts that are considered safe. 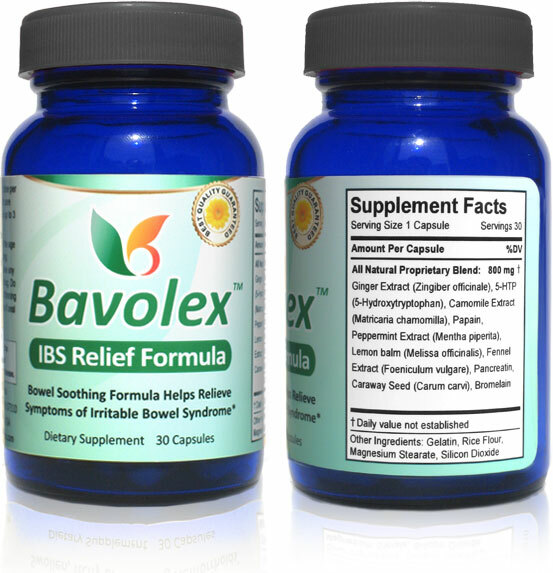 Our customers have been using Bavolex every day since 2009, and so far no adverse events (side effects) have been reported. As with other supplements we recommend that you don't use Bavolex products while nursing or pregnant because the effects on fetus have not been tested. You should not take Bavolex if you are taking blood thinning medication or antidepressants. 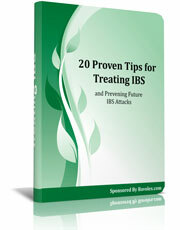 In this eBook, you'll learn 20 tips to stop Irritable Bowel Syndrome attacks forever. These tips cover diet, ways to prevent an IBS attack, and stress reduction. This no-nonsense eBook is a lesson on simple lifestyle changes. A priceless eBook for anyone who wants to put an end to this embarrassing inconvenience. 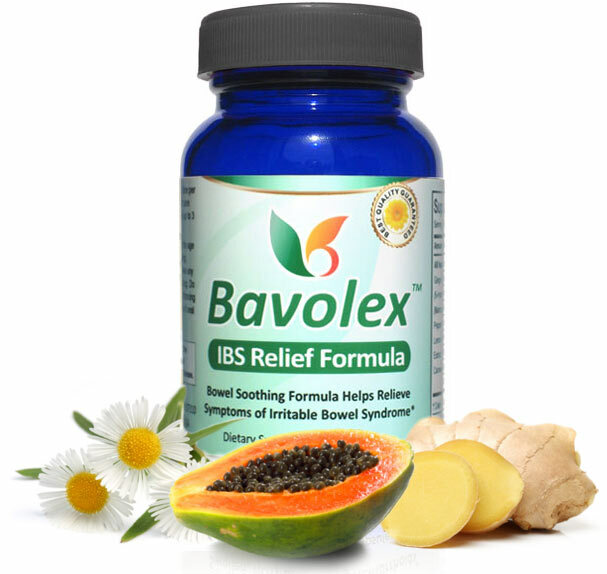 Natural ibs medicine Bavolex Natural IBS Remedy Bavolex herbal supplement uses natural ingredients such as chamomile, fennel seed, peppermint, ginger and lemon balm, to name a few, as a natural IBS medicine.